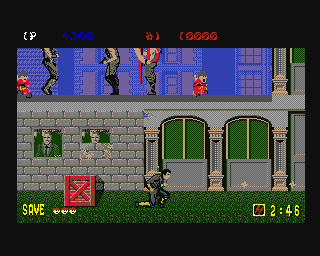 This port of the Arcade classic Shinobi was handled by Binary Design Ltd who also coded the 8-bit Amstrad CPC version. Unlike the Master System port which gave you a life-bar, this version stays true to the Arcade original in which there are one-hit kills. Unfortunately the play area has been severely cropped and it's difficult to see your surroundings and what lies ahead. This results in many unfair deaths as ninjas fly through the air off-screen and suddenly attack you. In the second Mandara stage you need to travel vertically at times and you'll die many times from projectiles that you couldn't even see. The controls are unresponsive and it's tricky to make split-second reactions as your character sometimes refuses to turn around quickly enough! You do have one magic item you can use per level which causes massive damage to enemies but it's mapped to the Space bar; the developers didn't have much choice here due to the one-button layout of the Amiga but it does highlight the main flaw with the system itself as you have to take your hand off the controller to activate it. To its credit, the game does includes all of the stages unlike the PC Engine port. The first-person Bonus Stage is also present but it's so slow and it takes forever to move your character. The final boss only has one attack pattern instead of his usual three and it's almost as if the developers couldn't be bothered! The graphics don't look much better than the 8-bit Amstrad CPC version as they have little detail, poor animation and a low framerate. Most of the Arcade's voice samples have been included but the music is horrendous with tinny, scaled back tracks that manage to sound off-key! This Amiga port of Shinobi is a complete shambles and an embarrassment to the franchise. If you're looking for a decent home version I'd recommend sticking to either the Master System or PC Engine ports as they do a much better job of conveying the fluid action that the series is known for. Random trivia: Binary Design also developed a few other games for the Amiga, most notably Fued (1987), Double Dragon II: The Revenge (1989) and Steve Davis World Snooker (1989).